Place white melting wafers in a microwave safe container. Microwave at 50% power for 30 seconds. Stir thoroughly and continue microwaving in 15-second intervals, stirring each time, until smooth and completely melted. Using a fork, dip the pretzels, one at a time, in the bowl of white melting wafers. Flip pretzels over to fully coat and shake off excess. 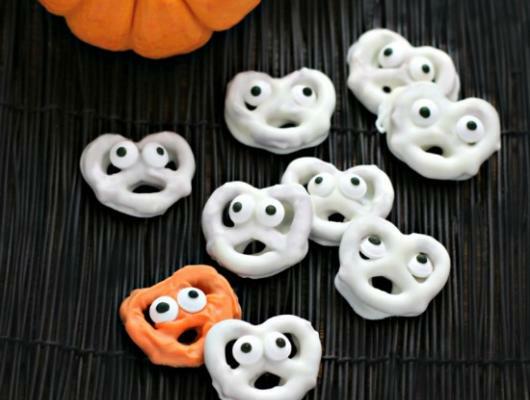 Place dipped pretzels on the prepared baking sheet. Immediately press two eyeballs into the top two holes for eyes. Let rest for twenty minutes. Peel off after they’ve hardened and store in an airtight container. Enjoy! 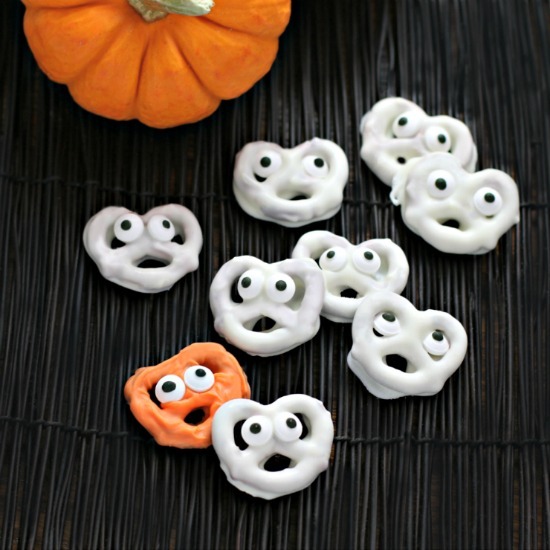 Delicious Chocolate Ghost Pretzels are salty/sweet white chocolate dipped mini pretzels turned into darling little ghosts with candy eyes using only 3 ingredients. It’s the perfect (and tastiest) edible craft for little kids too. Boo!